First of all, I'm having a blast reading all the comments about your favorite Christmas memories in my giveaway's comments. 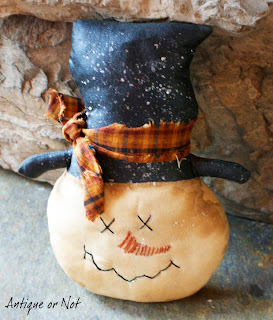 If you haven't entered yet to win this adorable prim snowman tuck, there's still time...just click here. I don't know if anyone has noticed, but I spent the last several days totally revamping my blog's "look" and the way it works. You'll see a light green tab bar just underneath the blog's header...this is where you'll find a lot of the items that used to "busy" up my sidebars. The new look is a lot less cluttered and I really like it. You'll find my favorite blogs list under the tab heading "Get Inspired". It seemed appropriate because I'm constantly learning and growing from the wonderful posts from my bloggie friends. If you have a minute, click on the tab and make some new friends too. If you're interested in becoming a "follower" of my blog or would like to keep up with our news in various ways, click on the "Subscribe" tab. There you'll find the familiar "Google Friends Connect" widget and icons to click on to follow me on Facebook, on Pinterest, or to have my blog posts delivered directly to your inbox. If you'd like to visit my online store, just click the tab labeled "My Website". A new window will open and take you directly to my shop where you can check out the latest goodies. And if you'd like to check out some great giveaways sponsored by my bloggie friends, click on the "Giveaways" button to see what's new. As for my diet, I'm hanging in there...believe it or not. I've been on a "plateau" for about a week now, and even Thanksgiving didn't budge the scale's needle one way or the other. And for that I'm truly grateful! 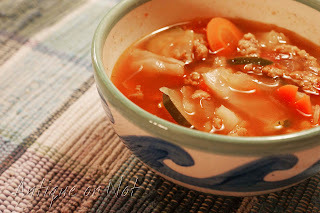 Avoiding prepared foods, eating lots of fresh fruits and vegetables, and trying to eat at least one bowl of homemade soup a day has been helping a lot. Speaking of soup, remember the Name That Soup! post that I did? After careful consideration of all the feedback, I've decided to name the soup "Southern Harvest Soup" and will change the original post to reflect that. Thanks to everyone for their contributions! My quilting obsession hobby is progressing. Today I went to my first sewing circle and made my first quilt block. My new quilting mentor brought me a fabulous goodie bag filled with quilting books, fat quarters, and various supplies. What a wonderful girl that Annie is! After the sewing circle, I made Hubby drive me to the nearest craft store so that I could buy my first fabric. I bought five coordinating fat quarters and a yard of fabric to use as backing. Don't know what I'm using it for yet, but I know I'll find a simple pattern that will be perfect. Besides, it's so pretty!